Opened June, 1943 a mile outside of Nanyo (now Nanyue) [lat. 27-13, long. 112-43), Hunan Province. At the end of May, 1944, moved to Hungkiang (now Hongjiang) [lat. 27-12, long. 109-50], Hunan Province, 120 miles west of Nanyo. During the last week of September, 1944, moved to Chenyuan (now Zhenyuan) [lat. 27-04, long. 108-26], Kweichow (now Guizhou) Province, 60 miles west of Hungkiang. During June of 1943 Camp Two was established in a two-thousand-year-old temple located a mile outside of Nanyo (now Nanyue) [lat. 27-13, long. 112-43], Hunan Province. This unit built on the learned techniques of Unit One and trained guerrillas in the use of American small arms and demolitions; there was special emphasis on carrying out raids on, and the mining of, the waterways of the Yangtze River and associated lakes in Hunan and Hupeh (now Hubei) Provinces. Lieutenant Merrill R. Stewart was in command; LTJG Claude I. Carroll, executive officer. There were two additional officers – L. J. Karwaski and J. E. Lazarsky, both of whom were Army second lieutenants – and 14 enlisted men as well as Chinese associates and helpers. Camp Two was only 40 miles north of the airport at Hengyang and could be supplied by air or truck. Hengyang was the home to the 75th A.A.F. (Army Air Force). Two columns, 2 and 4, of Chinese commandos operated around the nearby city of Changsha and became students for the training program. Camp Two developed into the most productive guerrilla training center in SACO. The first class of about 300 men graduated in early October, 1943. The complement of the second class was 670. Four groups were trained at Nanyo and the second became recognized as the “best” of the four. At the end of May, 1944, the Japanese started a major offensive southward along the central corridor. Camp Two was forced to move its operations, as well as the fourth class of 1,500 Chinese, westward 120 miles to Hungkiang (now Hongjiang) [lat. 27-12, long. 109-50]. The new camp was a walled military compound; it took two months for the men to screen and partition the quarters, construct a galley and ready the camp for operations. A class of 200 intelligence officers were schooled in guerilla warfare school at Hungkiang and then deployed locally. Up to this time the Chinese Generals had welcomed the instruction of their men but had refused to allow the Americans to fight alongside of the Chinese troops. In May, 1944, Gen. Ho Yuen-ting invited Lt. Theodore R. “Ted” Cathey, a well-respected Unit Two instructor and a Marine, to accompany Column 4 into the field. This column consisted of several thousand men, half of whom had graduated from Camp Two at Nanyo. Lieutenant Cathey later said, “I consider the Fourth Column comparable to an American battalion if operating under similar conditions.” (Miles, 1967, p 347) For three months during the offensive that started in May, Gen. Ho stayed with the Japanese army of 10,000 which marched in columns of about 800 each. Column 4 engaged in 34 actions in which 967 enemies were killed and 199 wounded. The Chinese guerrilla losses were only 14 dead and 10 wounded. As well, large quantities of supplies were captured. The Column 4 combat results improved considerably under the new arrangement and other generals decided to integrate SACO Americans into their columns. By war’s end there were about 1,000 Americans working intimately with 100,000 guerrillas and more than 200,000 plainclothesmen, in 14 active guerrilla columns. On May 15, 1944, LT Joseph D. Bennett became commander of Unit Two. Almost immediately LT Bennett and 1st Lt. M. S. MacGruer went to Nanning, 300 miles to the south, and ran instruction classes for Columns 1 and 3; the spoken language there was Cantonese. In August, 1944, Unit Two personnel, under the command Lt. Cmdr. J. S. Shaver, started Camp Five at Nanning. Another detail under the command of LTJG Guy Loyd went to Yuanling to establish a River Raider school. During the last week of September, 1944, the Japanese drive from Hengyang to Paoching (now Shaoyang) again forced Camp Two to evacuate; this time 60 miles further west to Chenyuan [lat. 27-04, long. 108-26]. This new location was a grade school between two hills and overlooked a wide river. In two months this was rebuilt to the same standard as the camp at Hungkiang but with improvements such as showers, cleanable galley, electric lights, and toilets. No courses were taught at the Chenyuan camp. The mission had shifted from training to operations. In early December, 1944, COMO Miles walked two days to Loong Hai Pu, near Paoching (now Shaoyang), Hunan Province, in order to observe the activities of Column 4. The camp celebrated with a feast of pork, the first the men had seen for some time; their main diet had been “red rice”, that is un-husked rice. 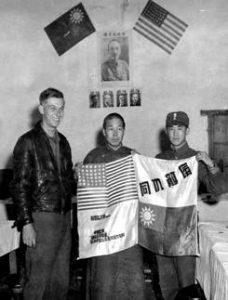 A nearby village was grateful for having been liberated and presented the group with silk embroidery that included a Chinese and an American flag. The natives had never seen the latter but had read that it contained “13 red and white stripes and a field of blue with 48 white stars in the upper left corner.” Their handwork was delicate and precise. Accepting the gift of thanks from the villager (center) were Chinese Colonel Lin (right) and U.S. Major E.P. Dupras, Jr. (left). Commodore Miles was invited to participate in a predawn ambush by the 3rd Guerrilla team. The Japanese were short on food and, according to reports from spies, were planning to forage for rice and might pass a good ambush location four miles west of camp. The Japanese troops in the area were afraid of the guerrillas, called them “short guns” because they were armed with short carbines, and usually did not attack unless they outnumbered their foe by at least ten-to-one. About 25 to 30 guerrillas left camp after midnight, waited in the cold a better part of an hour, and returned by 5 AM. Ten or eleven Japanese were killed in this raid. Column 4 spies discovered near Paoching a three-acre go-down which contained stockpiled rice, winter uniforms, and several hundred cargo horses. This target information was hand carried by COMO Miles and crew who walked 90 miles in three days and drove very uncomfortably in a jeep a fourth, to the 5th Fighter Group of the 14th Air Force (called the “Fifth Fighters”) at Chihkiang (now Zhijiang). The Fifth Fighters destroyed the go-down; Sgt. Earl McCalmon and LT Maury Nee, SACO men, rode along to identify the targets. The Japanese winter offensive ground to a halt; one rumor was they ran out of winter clothing. Americans from Unit Two were staying in the field with, and instructed at the camps of, the guerrilla columns. For more than a year Lt. W. E. Bulkley accompanied Column 4 and coordinated many operations with the Fifth Fighters. Lacking radio contact Lt. Bulkley used ground panel signals to transfer information and sometimes made arrows out of white cloth to point to targets. The grateful pilots dropped valuable supplies such as ammunition and signal guns. On April 10, 1945, a ground-air liaison was established between Column 4 and the Fifth Fighters. Six groups of three Chinese each were trained and equipped at Camp Two and then stationed throughout the area. The six units sent target information to the Fifth and were on the lookout for downed fighters. Two of these units, the Yuan Chiang Sabotage Unit and the Changsha – Yueh Yang Unit, delivered considerable actionable information. Shortly after Japan sued for peace in mid-August, Column 7 chased the reluctant-to-leave Japanese out of Hengyang, 275 miles north of Canton. RESULTS OF CAMP TWO AND COLUMNS 2, 4, AND 7. § YCSU (Yuan Chiang Sabotage Unit) and the Changsha – Yueh Yang Unit were part of Column 4. *Puppets – Chinese soldiers who were paid by and took orders from the Japanese. Miles, M. E., 1967, A Different Kind of War, Doubleday & Co, Garden City, NY. 629 p.